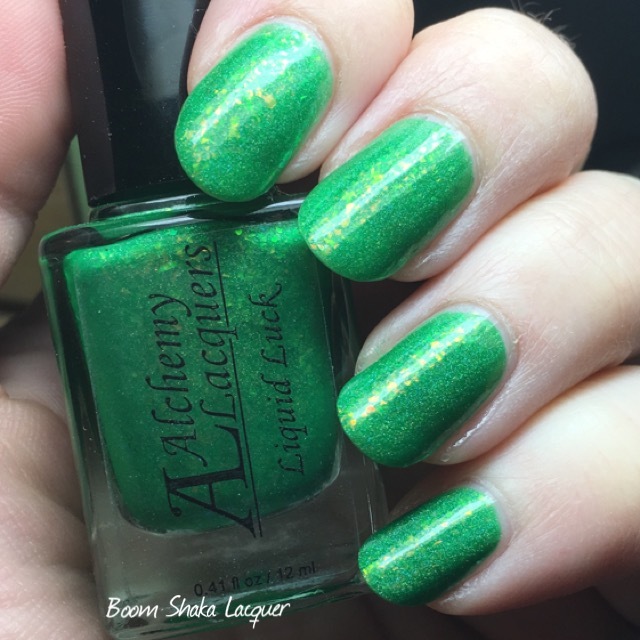 Alchemy Lacquers Lab Report – St. Patrick’s Day! Hello my lovely readers! 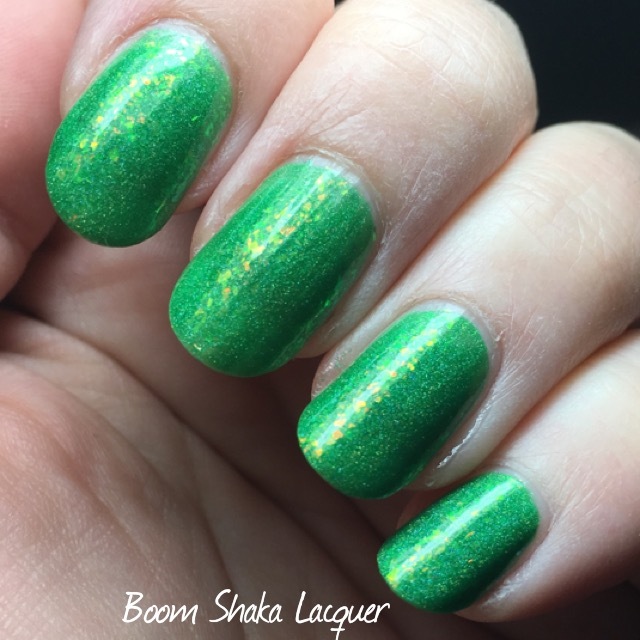 I have the Alchemy Lacquers’ St. Patrick’s Day-themed polishes for you today! These are just awesome. There is a new Moonshard which will become part of the Moonshard collection and a Potion which will not be available after March. The potion comes with a stinking adorable set of vinyl nail decals…wait until you see! I don’t want to keep you in suspense too long so here we go! 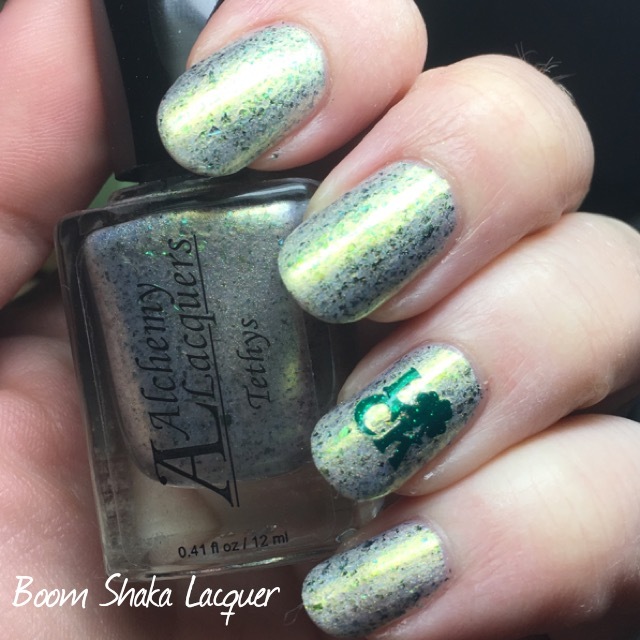 If you haven’t ordered from Alchemy Lacquers before, let me show you something that I find adorable! Whenever these polishes go out they are wrapped up in tissue that matches the polish with a little name sticker on the outside. It’s like a hint of the magnificence that you’ll see once you rip into that tissue paper! Although, I don’t rip mine I can’t stand to, I always peel the label carefully to reveal the polish inside. 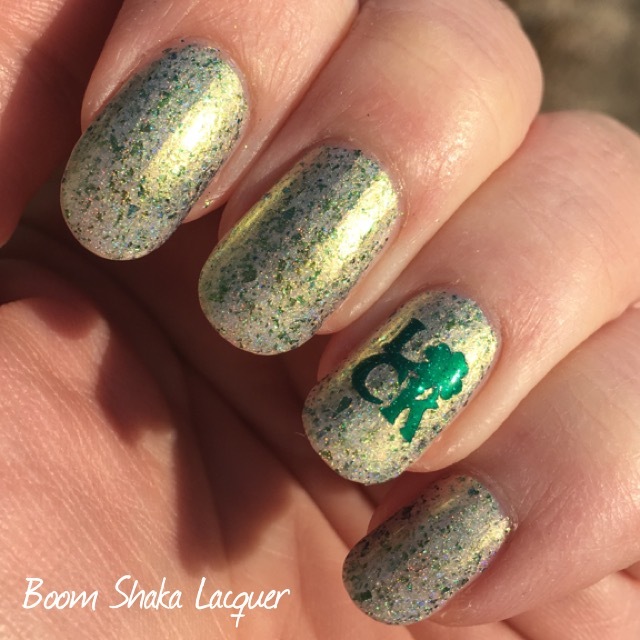 This month the name sticker on the outside for the Potion is shamrock shaped…how stinking cute! Now I used one of the nail vinyls on this swatch but I’ll talk more about them later, they actually come with the Potion. But this polish…it’s no secret I’m a fan of the Moonshard collection, beautiful shifty bases with shifty multichrome flakies…sign me up! Tethys is a shifty gold based polish packed with green to gold shifting multichrome flakies. Oh and did I mention it’s holo too? SO much happening here, it’s complex and beautiful! All the flakies give the gold a greenish cast but it is most assuredly gold. I feel like I might have found the pot of gold at the end of the rainbow with this one. The formula on this is what I have come to expect. Honestly, sometimes I feel like I repeat myself over and over but Rebecca is such a perfectionist when it comes to her polishes that I’ve really come to expect that. This is a relatively sheer polish, you could layer it or build it to opacity (as I did) but it’s still not excessive, I have really long nails right now so I had to do an extra half coat at the tips to cover nail line, but folks with shorter nails or less prominent nail lines won’t need more than two. Bonus sun shot! I was still wearing this when I ran out to check the mail so I snagged a picture for ya’ll. All pictures show two and a half coats plus topcoat. 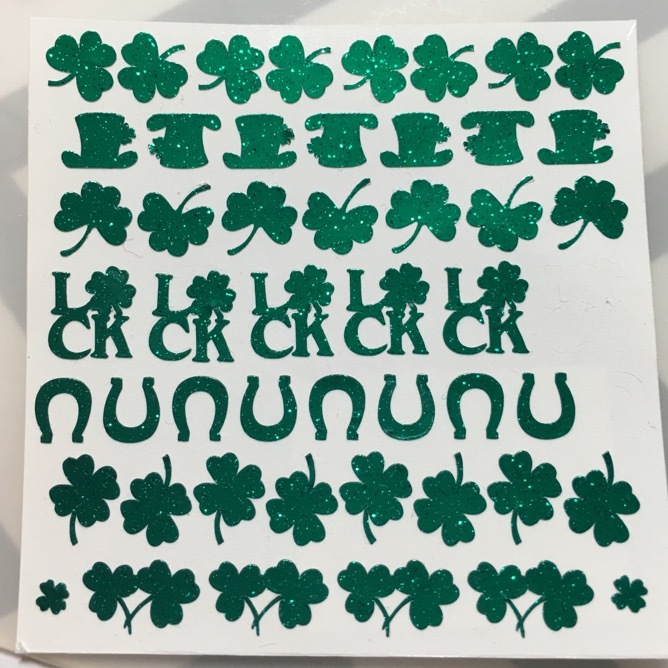 Now, Liquid Luck comes with an adorable little sheet of glitter vinyl nail decals. And they are stinking cute. Just look at how adorable. These are also perfectly sized for nail decals, despite the length of my nails I actually have fairly small nail beds so I love to find little vinyls that work perfectly for me. You said polish? Ok here we go for real this time! 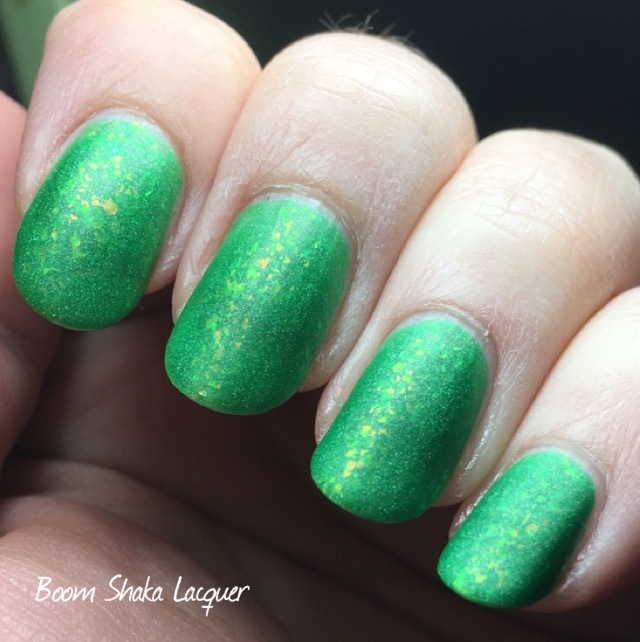 Liquid Luck is a bright delightly Spring grass green crelly. 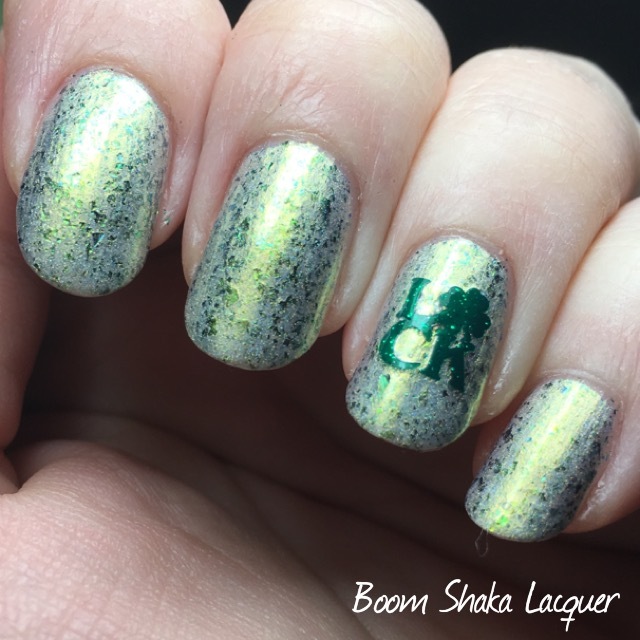 There is a pinch of linear holo, and a whole bunch of gold iridescent flakies. The crelly is closer to jelly than creme so it’s a bit squishy looking as well. I could not resist matting it which just made the flakies pop even more though I lost that tiny bit of holo because of the matte topcoat. Formula was excellent on this. The flakies spread nicely and don’t clump up. It is a tiny bit sheer (moreso than I thought it would be because of the way it looks in the bottle) but I didn’t find this to be an issue as it built up nicely to opacity in about 2.5 coats (for my long nails). Application was smooth and easy. Pictures show 2.5 coats with a shiny and a matte topcoat. 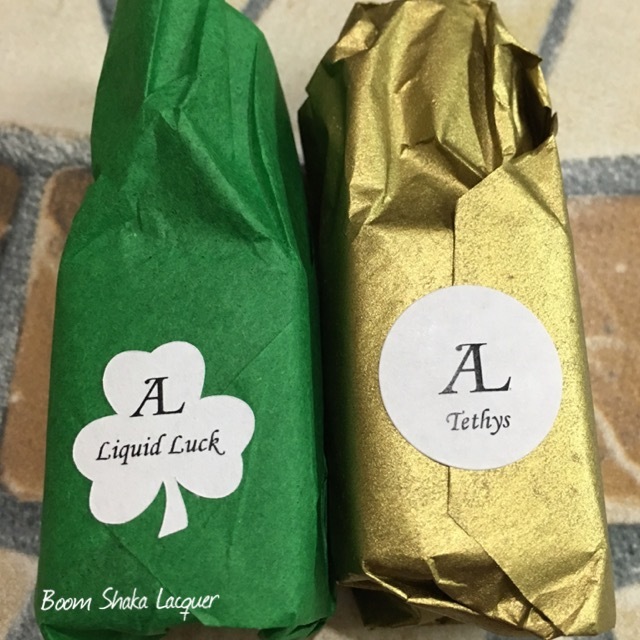 Now don’t forget Liquid Luck is only available for the month of March. You’ll want to snag that beauty before it’s gone! These are going to release on Friday March 4. 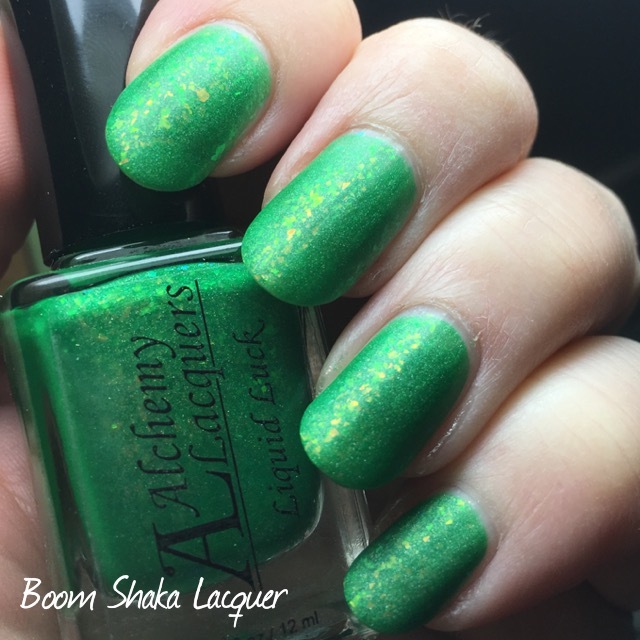 I’ll post the store and social media for Alchemy Lacquers below, per usual! I have some exciting new series planned for all of you soon so keep watching out here!